Thomas Friedman on advantages of Green Economy 01/12/19. A first cause approach to climate concern should be the amount of energy consumed by all of the various systems burning fossil fuels. The human household effect on electrical usage is well demonstrated in the figure below, from Bonnie Maas Morrison, University of Minnesota, 1990. The world, including the US, encountered an energy shortage in the early seventies due largely to oil embargoes. The response of the consumer had to be instantaneous, there was no time for developing new, energy efficient technologies. We just followed our leadership and first reduced our use of electricity by changing our basic habits. The results are shown by the downward inflection of the consumption curve, around 1972. This continued to be flat for several years before returning to the normal consumption. This well demonstrates the cost effective potential available in our citizenry, with the right motivation. The following is the full paper in the report. ASME President says that engineers have an ethical obligation to reduce climate effects of energy usage. Four Nobel prize winners addressed a conference recently at Texas A&M University where they cited evidence showing that man is a key contributor to the changes in Mother Earth’s climate and the effects of recent adoption of less polluting energy generation are discussed. The report below showed up (03/30/16). As usual, one side is emphasized. Back when Kyoto was first presented, the reaction described in this article expressed the feelings of many, including myself, that we do need to care for American industry first and not use this as a springboard to socialism, world government. If, at that time, the present deniers had done their homework and come to grips with the science we would not be in the pickle we presently find ourselves. Al Gore’s Inconvenient Truth, best I can remember, was factually correct but also had political implications which further polarized society. But, for whatever cause, we have developed a polarized and somewhat paralyzed society when it comes to dealing with energy policy. Possibly, the deniers recalcitrance has driven some to think that world government is the only solution; who knows at this point. Certainly George Will and the Koch Brothers would not be expected to support this and I do see some problems developing there. But, we do all inhabit the same planet and climate is a global matter so some cooperation is necessary. The Paris pronouncement is on target, not perfect, but at least on the right track. it is just unfortunate that it took us so long to get here. I have a copy of Naomi Klein’s book This Changes Everything and I will be open to new views while reading it. 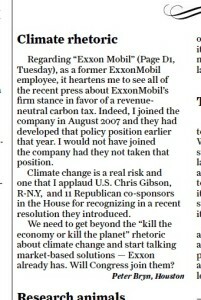 Houston Chronicle article reporting Exxon Mobil’s acknowledging man’s effect on climate and endorsing a carbon tax as the fairest way of accomplishing the process 12/07/15. Senator Ted Cruz of Texas held hearings on climate change on 12 December 2015. Those testifying before the committee included Adm. Titley as well as several other experts on climate. Also on the panel was Mark Styne. The link to the 2 hour plus video is below. If you watch it in its entirety you will be well informed on the science as well as the politics of the controversy of climate change. But, you must watch all of it, not maybe in one sitting. ExxonMobil CEO in June 2012 acknowledges man made global warming but says that with better science and math education and engineering that society can adapt. 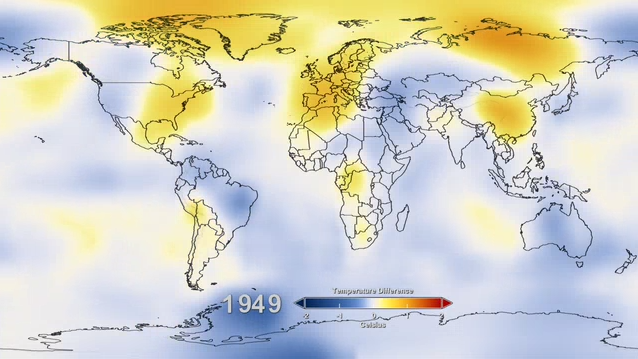 Most recently we have video of the destruction of the forests throughout the western part of North America due to the temperature rise long predicted by climate scientists. 2014. Click the link below. The effects of global temperature rise are now appearing locally, on a scale that is obvious to a nontechnical observer. The historical path of the material below starts in the 1950’s and proceeds to the present where videos of mass killings of whole forests in North America indicate the localized effects to be anticipated. Is the Planet Earth a sustainable system, or is man destined to go to a mass extinction and the planet lose its life supporting conditions? Assuming that the universe and hence Earth are created by a Creator, or just an unknown force, and that Man was created with the extraordinary brain, it is reasonable to predict that the planet can be maintained and life supported. The purpose of this page is to increase awareness of climate change, caused by natural events and human acts. The effects of global warming on humans will be significant since the human settlement pattern is largely concentrated on the coasts, particularly in Texas, and the coasts will be most affected by sea level change. The problem is exacerbated by the interaction on the coasts of sand deposits from river outlets and subsidence due to water and soil pumping from the ground. For a variety of reasons, the rate of sand deposits at the mouths of the rivers has decreased in modern times so that the shorelines are not being replenished. Anderson et al. (2014) showed the the rate of retreat of the shoreline in Texas is five times the previous rate and no abatement plan is in effect. The following was distributed by the American Society of Mechanical Engineers (ASME) at the time of the climate marchers descending on the UN. If you think about it, you should come to the conclusion that the free enterprise, or capitalistic, system is perfect for accommodating Climate Change. For most, the effects are felt either “at the pump” or “at the meter” the result being that the increased costs are passed onto the consumer, which, is where it should be. Both deniers and believers would be treated the same, no discrimination. Under a socialistic system, the government would try to reduce the effect on the population and absorb part of the increased cost, the ultimate result likely being bankruptcy. 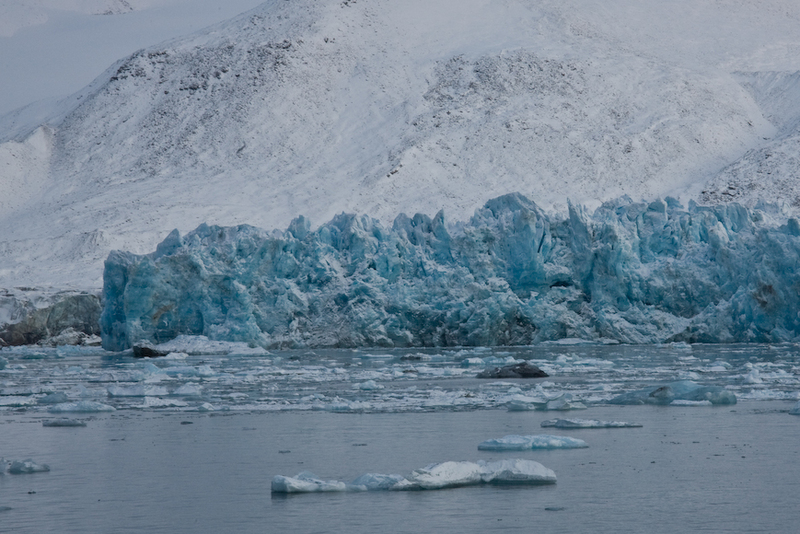 The Arctic is a suitable location to observe the effects of global warming. The view of the frozen ocean was dramatic when the submarine USS Skate broke through the ice at the North Pole on two occasions in 1958 and 1959. USS Skate surfacing in the Arctic, 1958 left, 1959 right. From US Navy Arctic Laboratory. Then, it became possible in 2009 for shipping to navigate through the Arctic Ocean, greatly reducing the shipping time between some ports in North America and Asia and Europe. 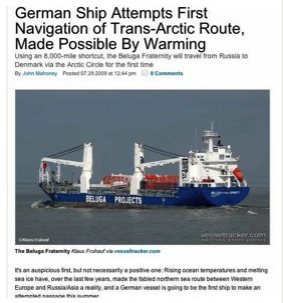 German ship navigates Arctic passage in 2009. Finally, we see a scene from the tall ship Antigua off the Svalbard Archipelago, in September 2011 above the Arctic Circle, near Norway. The North Pole ice is thinner in September 2011 than it was in September 1961, and the Arctic ice cap extended further south in September 1961 than in September 2011. The North Atlantic Drift prevents the western coast of Svalbard from icing-up as soon as the northern and eastern coasts. 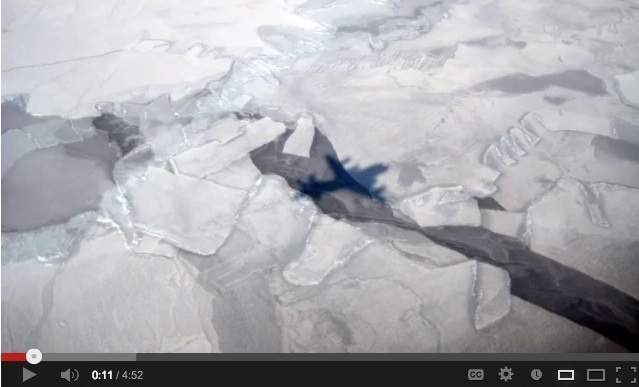 Click on the link below for a recent MIT video on polar ice. (Note: the trend continues and I have ceased to update this link.). Expected coastal flooding due to melting at the poles is described by Anderson et al., (2014), as listed in Geology Sources. 1. Make informed choices on the major activities involving energy, i. e. transportation, manufacturing and human comfort. 2. Better engineering. Engineers design and specify the systems that consume and convert energy. 3. Better science education since this will facilitate steps 1 and 2 above. Global Climate Change, The Science, Economics and Politics, The Bush School of Government and Public Service and the Department of Economics, Texas A&M University, College Station, Texas April 6, 2001. Vulnerability of US and European electricity supply to climate change Nature Climate Change/Letter 676-681, 2012.